Cockroach Berry usually flowers and fruits as a shrub about 1-2 m tall but also flowers when smaller. Leaf blades are about 4-8 x 4-7 cm, hairy on both the upper and lower surfaces also with erect, straight about 4-10 mm long spines present on both surfaces particularly along the midrib and main lateral veins. Leaf-stalks are about 1.5-2.5 cm long. Leaf blade margins are coarsely lobed with 2 or 3 lobes on each side. Twigs and leaf-stalks also armed with spines. Inflorescence axis, flower-stalks and calyx are armed with straight spines. 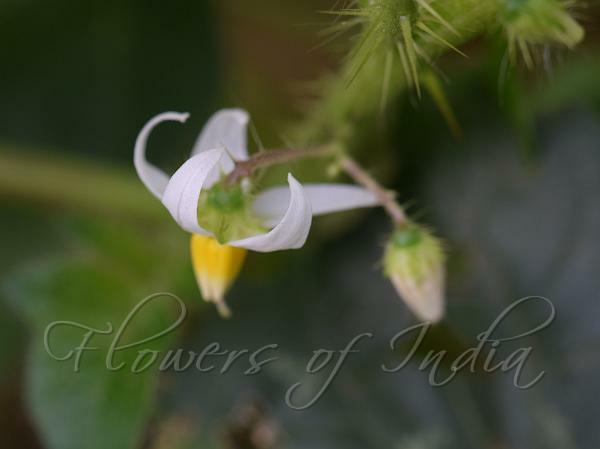 Flower-stalks are about 1.0-2.5 cm long, calyx about 4-6 mm long, sepals about 2-3 mm long. Flowers are about 2-3 cm across. Anthers are orange, about 5-7 mm long, filaments somewhat flattened or winged. Ovary is clothed in fine short glandular hairs, style short. Fruits are depressed globular, about 2.0-3.5 cm in diameter. Stalks are spiny, calyx green, spiny, persistent at the base of the fruit. 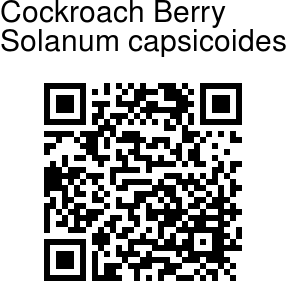 Cockroach Berry is native probably to Brazil, and widely cultivated and naturalized.